Western Digital has launched a new wireless-enabled hard drive that uniquely features a built-in SD card reader. The My Passport Wireless might be coming to the market after other wireless options like the LaCie Fuel drive, but it’s the inclusion of the SD card reader that makes this product of particular interest to photographers. When a memory card is inserted into the drive it can be set back up your photos or automatically ingest all images, then wipe the card clean afterwards. To view your images you can either connect the drive to a computer using USB3, or you can connect to it wirelessly using the free WD My Cloud mobile app. For photographers looking to travel light, this could be an excellent way to manage your photos on the road without needing to bring a laptop. The drive runs on an internal battery that reportedly provides 6 hours of video streaming and up to 20 hours of standby time and also features FTP functionality to allow wireless-enabled cameras to send photos directly to the drive whilst shooting. If you are working with a team of photographers and editors, up to 8 people can connect to the drive simultaneously to access the content. The My Passport Wireless drive will be available in late September, priced at $129.99 for 500GB, $179.99 for 1 TB and $219.99 for 2 TB. The supporting WD My Cloud mobile app is available for free from the iOS App Store and the Google Play store. IRVINE, Calif. – Sept. 3, 2014 – WD®, a Western Digital (NASDAQ: WDC) company and a world leader in connected storage solutions, today unveiled My Passport® Wireless, an easy to use Wi-Fi™ enabled storage drive that allows consumers to save, access and share stored content wirelessly with any smartphone, tablet, computer or other device. For the frequent business traveler to the family on a road trip or creative professional working in the field, the My Passport Wireless drive is a simple way to connect all computing and mobile devices to content without any wires or Internet connection. 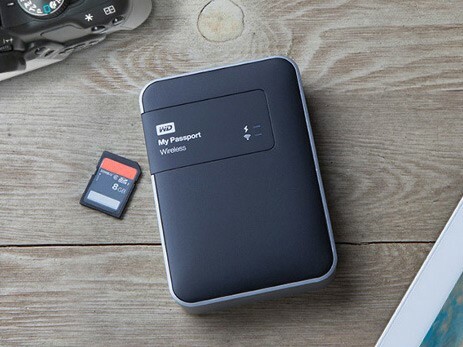 Additionally, when users need to transfer large amounts of data, the My Passport Wireless drive provides the option of using a high speed USB 3.0 connection. "As we celebrate its 10th anniversary, the success of WD's My Passport® line of portable hard drives is unprecedented," explains Jim Welsh, executive vice president, WD Content Solutions Business and worldwide sales. "Our new My Passport Wireless drive continues the evolution, resolving a common problem for today's mobile consumer; too many devices with limited storage and no way to offload their content and free up space on-the-go. Now, consumers will have one drive to easily store content from all their devices and enjoy that content anywhere they go." The My Passport Wireless drive broadcasts its own wireless network that allows up to eight devices to connect at the same time and access any content stored on the drive. Available in 500GB, 1TB or 2TB models, users now have the ability to store and access up to hundreds of hours of movies and music, as well photos and other digital files, from their smartphones and tablets that are typically limited by minimal storage capacity. The portable wireless drive features Wireless N with MIMO technology for enhanced wireless performance so that users can access and transfer files quickly, as well as stream up to four HD videos simultaneously. The built-in rechargeable battery provides up to six hours of continuous streaming and up to 20 hours of standby power making the drive a perfect travel companion. With the My Passport Wireless drive users have anywhere, anytime access to their favorite digital content by using WD's award winning WD My Cloud® mobile app for iOS® or Android™ mobile devices. The WD My Cloud mobile app easily connects to a My Passport Wireless drive for simple product setup, and once setup the mobile app provides intuitive navigation, sharing and playback of the drive's content. The WD My Cloud app also helps unify all of a users' content under a single app and user interface, by allowing access to content on the My Passport Wireless drive, the WD My Cloud family of personal cloud storage, and on major public cloud services such as Dropbox™, OneDrive™ and Google Drive™ from just one app. In additional to mobile devices such as smartphones and tablets, the portable wireless storage drive is an ideal companion for cameras with its integrated SD card slot. Whether shooting large commercial photography and video production or just taking photos and videos of the family while on vacation, the My Passport Wireless drive will never let you miss a moment because your memory cards are full. The built-in SD card slot lets users copy their content from the SD card to the My Passport Wireless drive to make room for more memorable moments. Additionally, with integrated FTP, the drive connects to compatible wireless cameras so that users can automatically transfer photos from their cameras to the drive as they are taking them. The My Passport Wireless drive is currently available for advance order online at the wdstore.com and will be available at select U.S. retailers later in September. MSRP is $129.99 USD for 500GB, $179.99 USD for 1 TB and $219.99 for 2 TB. The WD My Cloud mobile app currently is available for download for free from the App Store™ and Google Play™. Interesting old idea. Spinning hard drives are passe. BEWARE does not do RAW files! I got mine today to back up on-the-road images but it does not support raw files. I just need the device to copy the SD card contents to a time stamped folder. I do not need to review them or have slide shows, why the convoluted OS limiting the drive use? I was wrong, sorry WD. How do I remove that post? So does this support RAW and video files? I presume you can set it to not erase the card. SD has gotten so cheap, I stopped erasing them. When I run out of room to store the SD cards I may have to start erasing them again. Or move to a bigger house. Tried to pre-order as offered in Western Digital's press release but web site declined. I really wish companies handled the intro of products better. Sounds like a great product, too bad they will not take my order for shipment upon release. Lots of comments about SSD and I would have agreed but I watched a commentary about the ATOMOS systems and they use traditional HDD for their "long term proven reliability". So I would trust that the experts know more than I do. I was starting to look for a drive like this. I want a small mass storage device to dump my SD cards onto as back up. It is fine it does not have two drives since I would keep my cards as is until ready to wipe. SSD would be a great premium version for the extended battery life and durability. I think the battery life is low. I also would at least a small LCD display for copy feed back and at minimum total file count on drive. This way I can at the very least have a rudimentary feed back files have been transferred. The smart phone is great interface when I have time to use it but in the end I am looking for a mass storage dump and run device. I can see I can do better feature wise with a couple combinations of the suggestions here but I don't want multiple gadgets for one purpose. I think you missed the JaP irony. Also I don't think the Pentax 645z takes anything other than SD cards. So, to me, that's not WiFi only, since all WiFi only can mean is "Wifi only file transfer". If it used an SSD drive then it makes sense as an SSD drive is about as safe as the original on the SD card, but with only one copy of your stuff on an HD drive, that makes little sense unless you don't wipe the SD card and keep both (but then you'd have to have many SD cards). I wonder if the drive is replaceable, and if so then it makes more sense to replace it with an SSD. In the early 1960s, I used a bulky film spool and motor drive that enabled me to shot 200 or more farms without reloading film. I have to have two cameras, one for fine grain and the other for speed. Now, I can take at least 500 high quality (fine) large full frame JPEG and RAW simultaneously on a single camera using SD and CF card. The Wi-fi and Wi-Eyes makes it possible to wirelessly transfer the files to my computer ON-THE-GO or directly to my blue-tooth enabled printer. Wireless function is nice, but seldom used for sharing with others. If the main function is backing up camera cards while on a long assignment or vacation, I would do it for redundancy or to have all photos in a single location, but would always COPY, and not MOVE. These days with either multiple 16GB or 32GB cards you can afford to keep feeding them to your camera, having a better failsafe than trusting just one card or one HDD. Remember, this is for a single backup copy, so don't wipe the card unless you bought two of them or already copied the card somewhere else as well. I would hope this would have some sort of index feature like a proper ingest (think PhotoMechanic) so it knows not to copy files it has already copied. That would make it useful for making a quick backup of images shot with a camera with only one card slot. I should also mention that, at least with my Nexus 7, I can use the USB OTG port, with appropriate app, to read/copy SD cards to the device, then copy the files back from the device to a portable USB OTG flash drive. Grasscatcher, A major reason for me buying a Nexus 7 was to back up my photos when away on holiday in March. I bought a USB OTG cable, downloaded and paid for an app and just couldn't get it to work. I thus didn't even take it with me. Why it's so complicated to hook up a camera to a Nexus 7 and copy photos to and from the device (and view them) is beyond me. Can it only work with SD cards? Why not CF? There are several types of devices on the market for backing up SD cards. The cheaper ones take the form of something like this: http://www.amazon.com/EZOPower-Portable-Wireless-External-Smartphone/dp/B00EP13JBC/ref=pd_sim_sbs_p_3?ie=UTF8&refRID=0K1FRCG26R96S94C5D98 and other variations from other makes. Should work in the field if you have an iPhone or Adroid phone. Also serves as additional storage for your smartphone/tablet. With that being said, I don't see any issues with the WD unit being reviewed. Yes, it has been done before; however, competition is always a good thing for the consumer, so more power to them! I'm not too worried about the spinning drive. I've had a WD Passport for about six years now that still functions great, has been carried around in various pockets many times, in the field, etc. and still shows no signs of impending failure. With that being said, an SSD would be nice, but will cost more. Grasscatcher, Sadly my experience differs with WD external hard drives. I've had 3 fail on me. Fair enough one I dropped on a wooden floor from 3 feet but the other two were very well looked after. They were all the WD Elements type drives that really were quite flimsy / the case was a soft plastic. They seem to have improved things a bit with harder, less easily squished cases but still I don't understand why external HDD cases aren't properly durable, either very hard plastic or some form of metal - even with some shock protection inside. With flash memory so cheap in USB pen drives I don't understand why we can't buy large capacity (min 500gb) external SSDs for a reasonable price as they should be much less prone to failure. Western Digital isn't known for SSD drives. The top SSD drive makers (Intel, Samsung, Crucial, Sandisk) all want over $200 for 500GB SSD. This thing gives you 2 TB for less in many cases than 500 of SSD. It would be nice tough to have the option. PalmettoFellow - just curious why you would want more than 500GB for a drive like this anyway? Its purpose is as a backup drive in the field... perhaps also as a way to access via iPad for instant viewing/editing... 500GB is an awful lot of photos..... its not supposed to be a long term storage drive. Not a new idea. Didn't Canon make 2 EOS shaped drives with CF and SD slots? I didn't need one then, but would certainly buy one now. As for the WD model, I would certainly buy one if it came with a CF slot as well. Just SD, is a bit limiting. I don't find the Wifi to be a useful feature the way it currently works. You can either join the drive's WiFi or another WiFi, but seemingly not both at the same time. I do own a LaCie Fuel. Cameras like the 5d MKIII have dual card slots - my primary cards are 1 maybe two 64gb CF cards (depending on wedding size) - backup is a 128gb sd card. When I bought it, there was nothing on the market it at an acceptable price. And the variety was very reduced or none. specifically dedicated to photography and photographers who seek portable storage without many cards, which were extremely expensive. Currently, I do not know if there is more worthwhile to buy more cards and walk lighter. However I think this type of product should use SSD. I shoot a web series on my iPad, and this will make life sooooo much easier! I'm always running out of space, and this is much cheaper than buying a new iPad. You are doing what with which device???? I produce a Doctor Who parody web series you can see on my website whatdoctortheseries.weebly.com and I shoot it using the camera in my iPad. The video is HD and looks great, but having only 16gb of memory is limiting, so this WD drive will give me a lot more storage. Wish Western Digital introduces a combined Memory Stick & SD card slot. I was just looking at some Sandisk wireless drives with SDHC slots at Best Buy the other day, so this is not a totally new concept, just new to the WD product line. They have been out long enough that reviews are already published. I am not dumping photos from a reliable SD card onto a spinning disk and then wiping the card. Fuji X100 -> 32GB Eye-Fi mobi -> iPhone 5s with iOS 8 -> iCloud photos in the cloud. They automatically appear on the iPad and Mac, if someone pinches my gear when travelling I still have all my pics. and then have it support CF, microSD etc ? MUST it be only SD ??? Virtually all microSD cards I see in stores come with SD adapters, so that is at least one additional format that is covered. I don't need to carry and fire my laptop for the wireless transfer to a hard drive. I used to attach the Wu-1a adaptor to the Nikon D600 for wireless connection to my laptop. I replaced the D600 with D800 because of the sensor / oil fiasco and bought SD and CF that has Eye-fi capability because the D800 cannot use the Wu-1a. I carry two card readers: (1) CF / SD Firewire 800 card reader and (2) CF / SD with 8 other card type, USB-3 for insurance. I wonder how could you do that. The Wu-1a os not compatible with the D600 (it usrs the Wu-1b) and those devices can only trnasfer to a 'smart device' (iOS or Android) not to a FTP on a laptop. Jaywalles - The Wu-1a came with the D600. Because there was no manual / instructions with it, I went to the NikonUSA website. Since I do not have the D600, I can't duplicate what I did to tell you how I did it. BTW, it worked with my Apple laptop and Samsung Tab but can only link with one device at a time. So you do something that is impossible acording to Nikon. First the Wu-1a is not compatible with D600, The one to use is Wu-1b, the same from the 1 series. Wu-1a is designed for APSc DSLRs, but it cannot be used in combination with a D600. Second, both Wu-1a and Wu-1b works with a peer to peer Wifi conection to a "smart device" using an App in Android or in iOS... but there is no App to use in OS X nor Windows. This cand be find even in "Nikon Answers", so it is official. I am VERY intresting in connecting wirelessly my D600 to a FTP over a standar net (not by peer to peer). but I'd never found the way to do this. I just feel that right now we could ask for so much more. 128GB of flash memory is getting pretty small and pretty cheap. So are card readers, and it can't take a supercomputer to run a simple backup. I'd like to see a genuinely small automatic backup drive that takes CF and SD and doesn't cost the Earth. Is that not possible? Until then, I'll stick with my 10in Windows device. why bother with a measly 128gb ssd when 64gb high quality cards are dirt cheap comparatively? if 128 GB is all you need, you don't need an external on site backup solution. "if 128 GB is all you need, you don't need an external on site backup solution." Yes you do. It's called a backup for a reason. You back it up in case you lose the images on the primary device. Yes, as Dave pointed out, I was talking about backing up cards in order to have two copies of my images ASAP, in order to guard against card failure or theft etc. I think that is a key purpose of the device in this article. There are already published comparisons elsewhere of several of the wireless storage devices (including the Sandisk devices which also have SD card capability). Can the card slot read SDXC? It would be nice to see this in a SSD format, at least then you would’nt need a battery to keep information alive. I'd like to see a camera stream photos in real time to such a device via low-power short range wi-fi without any internet or smartphones involved, this way you could keep the storage drive in your backpack while photos are automatically streamed to it as you shoot. Read the manual - The drive can do automatic FTP to get your images off the camera. That is if your camera support WiFi and the FTP protocol. NFC is way too slow. Wi-Fi is over 1000 x faster. If they made this thing a 2-drive raid with CF as well as an android-based viewer with LCD, in a rugged case, I don't mind paying $600 for it! Android would make it a full fledged computer, so why not just get a small note book like a MacAir? thanks DPreview for bringing this to our attention. Wished they had gone one step further and had a small LCD display where you go review the images and folders. those devices called Epson Multimidia Storage Viewer, I bought one of those 10 years ago and it still works just fine and has an amazing display. or maybe wifi to connect it to your phone. Previous portable back devices had one. I have had a Hyperdrive for a couple of years and I really like it. The viewing experience is pretty rudimentary...If the LCD was better it would be a much better device. the passport just doesn't make it for me (although it is really inexpensive) because it doesn't take CF cards. this would be great...if im on vacation and just finished a full day taking pics or video...i can dump the files to this while relaxing at the hotel and then insert the card back into my camera ready for the next day....USB 3.0 is fast enough even...only need to bring a couple of 64gb cards and i'm set...never need to bring my laptop anymore. Are you going to cross your fingers each time as well? Re. crossing fingers, should be able to check from smartphone before wiping the card. And then keep your finger crossed until you get back home and check that the drive hasn't been shaken too much during the travelling? Mario G: that's equally true if you're only storing the photos to your laptop while traveling (i.e. without taking along a backup drive), as most casual photographers do. Even if you do take along a backup drive, unless you have a fast and affordable data connection, you can't do off-site backups, so there is still a risk (e.g. if all your gear gets somehow lost or stolen). I guess you could take two of these drives and do two rounds of saving for each card before wiping. Or take enough cards for the whole trip and keep that as a second copy in addition to the drive. I usually take a MacBook Air plus external drive, and upload a selection of my best images so far to Zenfolio as I go along whenever I have a good connection. But no solution is risk-free: you have to figure out your own tradeoff between safety and cost/weight/hassle, and this is going to be different for everyone. @misolo: yes sure, whether the drive is inside or outside the laptop shouldn't make too much of a difference (although external drives might have a higher risk to get dropped). I agree that nothing is risk-free (and especially keeping however many copies in the same place just covers you from a device failure but if you lose the "same place" that holds them all you'll still lose them). I just thought about this device as a backup (i.e. an additional copy to have besides your SD card, to keep in your hotel room and backup at the end of the day - so if you lose your card/camera/all your belongings while you're out, you still have the previous days of photos). The wireless card reader hub is an excellent option for on the road backup. Last year I used a Nexus 7 tablet and a Kingston Mobile Lite SD card reader/hub with a Seagate Slim HDD to store 3 month's of RAW files from my D7100. The hub and software worked reliably, but most importantly, they transferred relatively quickly - at about 8-10MB/sec, the limit of the USB 2 connection between the hub and HDD. Transfer speed is a major problem with many wireless reader/hubs and a big reason why Hyperdrive and Nexto are still in business - these companies use the SATA interface between their HDD and reader, which provides at least 2 times the speed of the Mobile Lite, which is the fastest transferring reader/hub on the market as of fall 2014. Typically, reader/hub transfer speeds are down in the 2MB/sec range, making large SD card backup impractically time consuming. the Mobile Lite's speed makes it useable for the 16 and 32 and 64MB cards now prevalent. As others have mentioned, there are better "on the go" battery-powered drives with card readers out there for photographers. I have had one of the older model Hyperdrives for at least seven years. The "Achilles heel" of this device as a photo SD card backup is the reliance on a web-browser to actually copy the data. Apparently, you can't just put an SD card into it and automatically copy the contents to the HDD (like Hyperdrive iUSBPortHD and Sandisk Connect); a supported device with a browser and screen (phone, tablet, laptop) has to be wirelessly connected to tell the drive to copy the contents. With this second device required, there are many alternatives (RavPower WD-01, Kingston MobileLite, Sony WG-C10, etc.) that can duplicate the functions, if not the storage space, and many of these can also charge the phone or tablet at the same time! That's quite a design oversight... even if everybody might have a "capable device" phone in the pockets, it's just gonna make the whole process quite more of a hassle than what it should have been. Is the phone/tablet just needed to kick off the copy at the beginning, or does it need to stay connected for the entire copy to avoid interrupting it? The second device is most likely your phone. WiFi connection is needed for it to work. Well, maybe I was wrong... and Western Digital really needs to publish more information on their spec pages than how many songs it can hold! After reading the vague WD claim to "instantly transfer" data from an SD card, and watching a launch video that only showed SD copies via an iPad (? ), AnandTech mentioned a one-touch SD backup. Digging through the manual (!) it says "To manually sync the SD card and drive, press the WPS button quickly." One sentence, and no explanation if "sync" really means it only copies new files. Plenty of warnings that "move" (as opposed to "copy") means it will delete the data on the SD card, though! Perhaps "someone" should review the current mobile backup devices for photographers? I think one of the screenshots in the manual shows the options for this function. It's disappointing that we have to go through the web interface to control it. But this is an interesting device from a mainstream vendor. I think I read somewhere else that you can set up the default to transfer data (initially via a wireless device) from the SD card to HDD as soon as you insert the card; the other option you can select is to delete the SD card contents after transfer, or leave the data intact. Isn't this what we called an "imagetank" in the era when memory cards were still very expensive? There still does not exist on the market a dual 2.5" HDD combo that allows configuration in RAID 1 (mirror). Large capacity drives make mirroring much more cost effective while enabling simple and solid fault tolerant storage. I'm also really surprised that we haven't seen similar large volume, yet slower, SSD mirrored storage using low cost TLC chips. Slower compared to regular TLC SSD speeds, but much faster than 5400 RPM 2.5" HDD speeds. Weird. Particularly so when considering the rising desire to have fault tolerant storage, especially for portable use where HDDs are susceptible to movement and being dropped or bumped. Go figure. No one was doing mirrored portable USB last time I checked a few months ago. The G-RAID Mini from G-Technology is a 2.5" HDD RAID 1 configurable portable drive. It seems like someone should be marketing an SSD RAID 1 portable drive, but I have yet to see anything. I agree but a hard disk covers more customers than an SSD since it is cheaper and with at least more than twice the space. With my experience, it is hard for me to fill a 16GB SD card in a day in RAW. With 32GB and 64GB cards becoming more affordable, I would not need to delete/move the files elsewhere from a trip or shoot and majority of us have more than one card. The external drive would be for redundancy in case of data corruption or lost card/camera. Would this work? It's been available for a while. "Large storage capacity and selectable RAID-0, RAID-1, or span drive modes..." and claims to be bus-powered. You can buy it empty if you want to put your own drives in it. The seller is a very reputable and well-regarded maker of RAM and storage. I've been buying their products for years, although I haven't tried that dual 2.5. 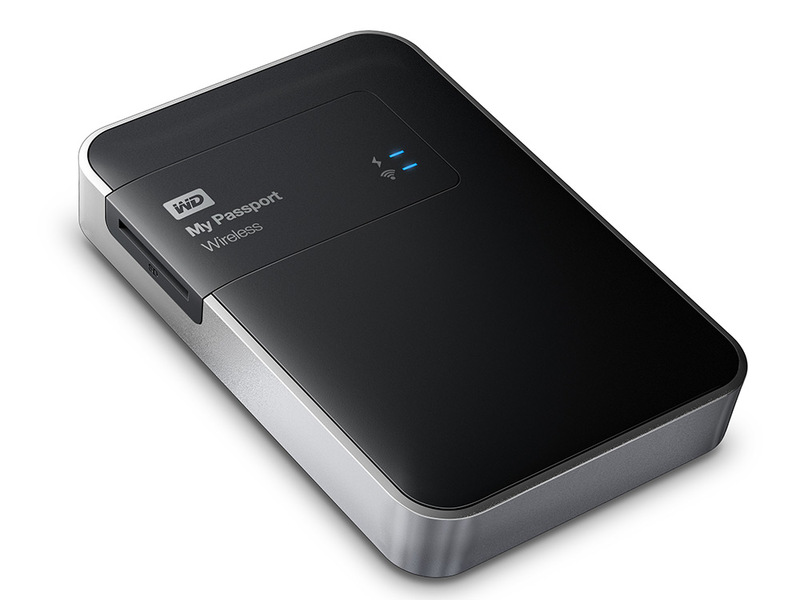 WD has what you want for Mac via Thunderbolt - Its called the Western Digital MyPassport Pro. I have one and it works great. No extra power cable needed. Its not fitted with SSD's, but you could replace the HDD's with an SSD if you whish. Do you have any source that confirms that SSD or another own HDD is possible in the passport pro? I can't find anything, but I know that in some other WD drives they use custom sized HDDs that aren't replaceable. The site below has a cutaway image where you can see the sata connectors on the two internal drives, so yes you could replace with SSDs, however maybe no trim support which may limit the lifespan somewhat. That G-RAID looks awesome. I do remember looking at that, too. Unfortunately, it requires a separate power supply which is why I continued to look. RAID 1 doesn't need to be implemented on an expensive device. It is entirely within the capability of a company like WD to bring out a dual HDD/SSD drive with RAID 1 in the same pricing structure as the rest of its Passport range. I opened the MyPassport Pro to see how and if it could be replaced. I find it too expensive at this moment to replace the two HDD's with SSD's. But as time progresses and SSD's are getting cheaper I might do it at a certain moment in time. So yes I can confirm that it is possible. Its a well built solution and you don't need an extra power supply. The only disadvantage (if you could call it that anyway) is that it is thunderbolt and only works on a mac. No mention of how this is powered. From looking at the WD website, it would appear to be USB powered (no battery). So not so portable then. However, portable (battery powered) card readers/storage units have been around for ages. So what is so special about this? Just the WiFi? Certainly not the portability. You missed this from the article: "The built-in rechargeable battery provides up to six hours of continuous streaming and up to 20 hours of standby power making the drive a perfect travel companion." You are right, I did miss that. I looked on the web site and the downloadable pdf, but saw no mention of a rechargeable battery. The small font size on this web site borders on unreadable for me, unless I use the zoom feature of the browser. Instead I prefered to go to the manufacturers web site, as it, at least, is readable. Yes, I have to magnify in the forums, and it makes it impossible for me on an iPad! Back to the device, remember it is not only for photo storage, it is also for streaming movies music etc to portable devices. So it is more than those simple storage devices. I would use it to back up my SD cards, but I would leave the photos on the cards as well. I hope there's an option not to delete files. I would switch the SD card to read-only anyway before putting it in this drive (or in any untrusted computer for that matter). Download the manual, it gives a choice between "copy" and "move", thus leaving the files there or not. How about a version for CF? Or CF and SD as used in Nikon cameras! Again, it offers the choice to move or copy, thus leaving the files on the card intact. We used to have this kind of portable backup devices like 10 years ago - I used one with D2X. That said, this looks much better than those ones. I still have that thing, though even back then I found it slow! The 2TB version is listed on Amazon U.K at £436.22! $712!! You are getting confused as the inter currency rates are purely financial and have absolutely no connection with the relative costs of actual products between the UK and US. To do the conversion just cross out the $ sign and put a £ sign and take 1 penny off. Exactly what I have been looking for, a HDD with built in SD card reader (don't really care about the WiFi). Will go perfect with SP that only has the one USB port and no full sized SD slot. I was surprised not to even be able to find a HDD caddy with built in card reader... well not portable 2.5" anyway. This is a seriously good idea for people who are doing long backpacking holidays (like I'm looking to do myself). This is an awesome and lightweight way to make backups of my photos - the only electronics I'll need are my smartphone, camera, and this hard drive! And a socket to charge them all.